Like the song in “History of the World Part 1” where the Jewish men are being tormented to get them to convert and Mel Brooks sings loudly “Send in the nuns!” My mom and grandmother missed their calling as nuns. Mom would have been the tough one the kids loved and her mom the even tougher one the kids were just terrified of. If they had been Catholics, I think they both would have been great nuns. 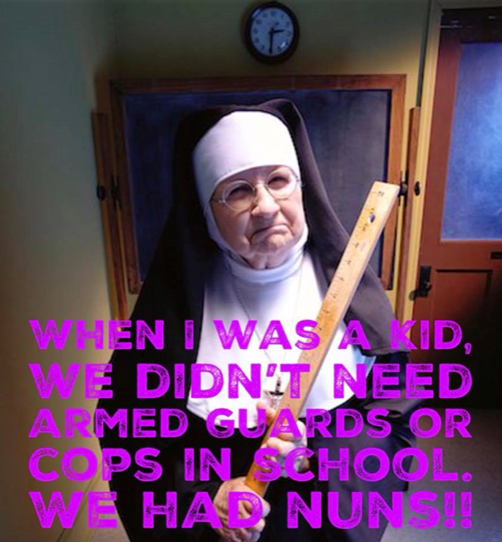 Oddly as a Baptist girl half raised by a Baptist minister and wife (her aunt and uncle), mom always wanted to be a nun. We never shared that w/ the rest of the family (wink, wink).